In late July, panic swept Yangon and parts of Myanmar as news of an “outbreak” of H1N1 erupted on social media. This followed a press conference where Myanmar’s Ministry of Health announced that two people had died from H1N1, commonly known as swine flu. A further 13 had been diagnosed with the illness in Yangon. Five hospitals were preparing to receive new patients. Other cases were detected in remote areas of Myanmar, including 10 cases in Matupi in Chin State, and others reported in Bago region, Irrawaddy Region and Naypyitaw. Hitherto far from being an outbreak by the World Health Organization’s definition of such, what the H1N1 cases really highlighted was how far Myanmar has come in health communication and cooperation. Indeed, Myanmar’s entire health system has come a long way since the country’s democratic transition began in 2011. Yet much more still needs to be done. A core area of focus needs to be on addressing inequalities in access to health services across the country. In particular, bridging gaps in service delivery between urban and rural communities and for minority ethnic groups. For the government, the pay-off for improving these services will be significant. Broadly speaking, increased confidence in government will have positive impacts on continuing ceasefire negotiations and political dialogue with ethnic armed groups. Indeed, addressing these issues will need to be both cooperative and to a certain degree centrally-directed, thereby demanding that ethnic minorities and the NLD government work together. For international donors, supporting the improvement of the health system in one of the world’s most disaster-prone countries, lying between the world’s two most populous countries, is investing in a more resilient region. This post aims to be a primer addressing some of the most pressing problems in the overall structure of Myanmar’s health system today. As the world moves to adopt strategies to establish universal health coverage by 2030, as part of the Sustainable Development Goals, Myanmar remains languishing behind in all components of the World Health Organization’s (WHO) health system building blocks. In order to achieve Universal Health Care (UHC) goals, as well as other outcomes set out by the WHO’s health system framework, Myanmar must significantly improve across all components, and in particular on three core building blocks – health services, health workforce and health information. This is assuming that other building blocks of leadership and governance, and health care financing will be achieved as capacity continues to be built within the system. The previous quasi-military government raised public spending on health from a dismal 0.2 percent of GDP in 2009 to more than 1 percent in 2014. Recognition of the importance of population health and investment in health continue to improve. Since coming to power in 2016, the National League for Democracy (NLD) has established Universal Health Care and access to a Basic Essential Package of Health Services (EPHS) as central policy objectives of the government, prioritizing health policy in its first 12 months of government. The latter part of this objective, increasing financial protection, is important. Indeed, significant improvements in health care financing must be achieved. There is no reliable health insurance system and a poor overall national health system. In 2014, 81 percent of Myanmar’s total health expenditure came from out-of-pocket financing. This figure decreased to 65 percent in 2015, demonstrating government attention to the issue. Out-of-pocket payments in Myanmar far exceed the global average of 32 percent of a country’s total health expenditure. Recent NLD health policy has set an aim of reducing out-of-pocket expenses to 25 percent of overall health expenditure. As capacity remains low within the MoHS and the wider health sector in Myanmar, there are numerous NGO’s supporting capacity building programs. One significant project is the World Bank’s Essential Health Services Access Project, a US$100 million project running between 2014 and 2019, which aims to increase coverage of essential health services with a focus on maternal, newborn and child health. As in most developing and many developed countries, discrepancies in delivery of health services between urban and rural populations also exist. Approximately 70 percent of the population in Myanmar live in rural environments, and are largely engaged in subsistence farming. Many of Myanmar’s ethnic groups still adhere to cultural practices and traditional remedies. Seeking out astrologers, witches and healers to administer health care is common. Such health-seeking behavior can cause complications in modern health care provision where less effective treatments or mysticism supplants modern medicine. While eight ethnic armed groups signed a ceasefire with the Tatmadaw, the Myanmar military, in October 2015, a dozen other groups remain in varying degrees of conflict. The deep and decades long grievances between ethnic minorities and the Tatmadaw have created sub-national governance structures, including sub-national health services. Without the emergence of a federal system that can incorporate these structures, there is widespread inequality in the delivery of services across the country. 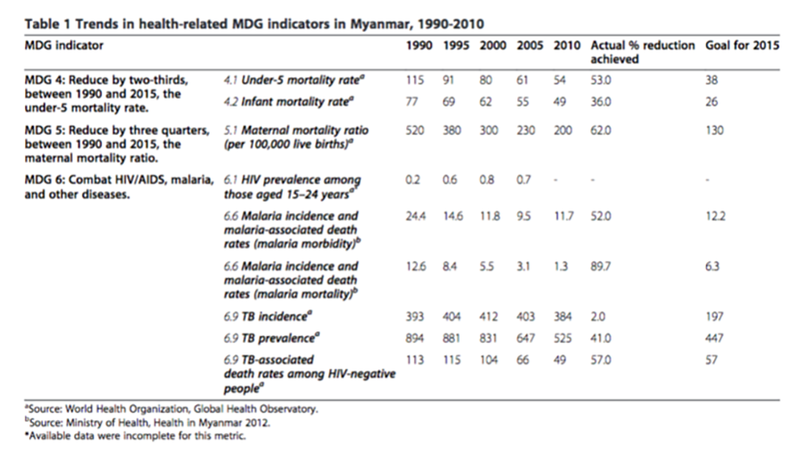 Reflecting the problems within Myanmar’s health system, the country’s success at achieving health related Millennium Development Goals (MDGs) were mixed. Indeed, one of the core problems cited was a weak health system. One area of relative success was the improvement in immunization rates. For example, measles immunization coverage increased from 68 percent to 88 percent between 1990 and 2010. However, as evidenced in 2016 by a deadly outbreak in remote northwestern Myanmar in Naga areas, disparities remain in ethnic areas. In that instance, more than 80 people, mainly children, died from a preventable disease. As indicated by the failures in the MDGs, the single biggest problem for Naypyitaw continues to be the implementation of a health system in ethnic minority areas where decades-long conflict with the central government has created deep mistrust. In dozens of townships around Myanmar, the government has little access and fighting between ethnic armed groups and the Tatmadaw continues. In these areas, working with local ethnic health organizations (EHOs) and local NGOs will be crucial if MoHS wants to fulfil its SDG pledge to provide universal access to healthcare to all people in Myanmar. Among other social determinants of health impacting Myanmar’s health services are poverty, ongoing conflict, endemic and institutional inequality, weak institutions and poor governance, poor infrastructure, seasonal natural disaster and poor access to adequate health care. 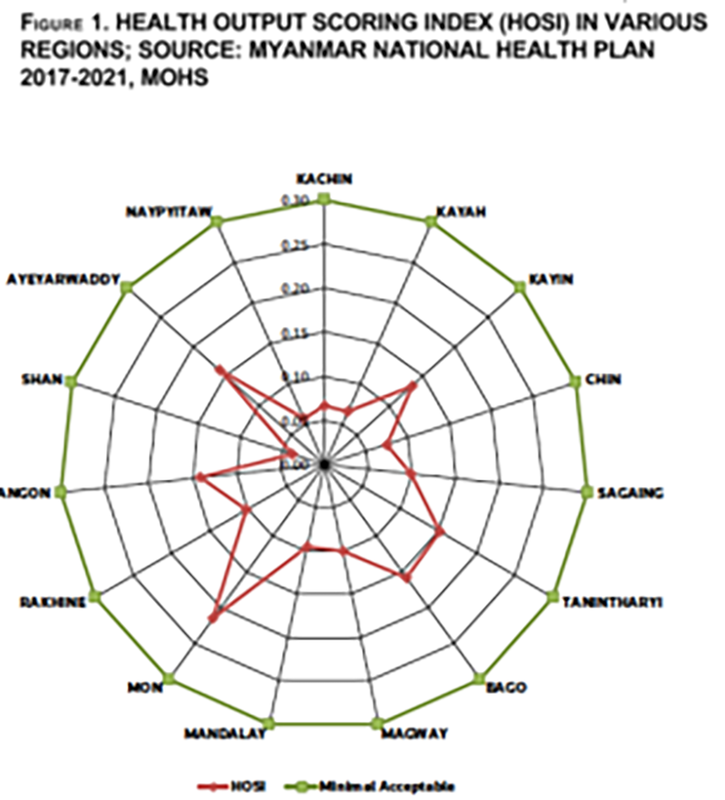 As detailed in the following critical analysis, three components of Myanmar’s health system will be important in addressing these challenges: Health Services, Health Workforce and Health Information System. Others, such as medical products and technology, will remain crucial but should improve following progress in the stated three components. In 2014, according to the MoHS, it operated 988 hospitals and 1,684 rural health centers. This included 348 maternal and child health centers. The Ministry cited 13,000 doctors, 30,000 nurses, 22,000 midwives and 11,000 health workers across the country. The number of health professionals was far less than the recommended WHO target per 1,000 people. Auxiliary or volunteer health care workers continue to play core roles in service delivery, particularly in ethnic minority and rural areas and they are often required to perform above and beyond their basic training. According to World Bank data, some indicators of health service capability indicate that services worsened over the course of military rule in the country. For example, in the 1970s and 1980s it was reported that there were 0.85 hospital beds per 1,000 people, this declined to 0.6 in 2006. Similarly, during the military government, half of health workers worked in urban areas, despite the vast majority of the population living in rural areas. Under the previous junta government, those living in rural and ethnic minority areas relied largely on traditional healthcare practices, rudimentary local health care or the services of international health professionals working with NGOs. There has long been a desire to improve the health workforce. This was explicitly stated in 2000 by the military government in a policy paper entitled Myanmar Health Vision 2030. The document also highlighted a desire for universal health care. Since the 2011 democratic transition began, efforts to improve the health system, including improvements to the health workforce, have been renewed. The NLD government has outlined a desire to decentralize health services, previously highly centralized. Today, Myanmar’s 330 townships are overseen by a township medical officer. At every main township hospital, there is a chief doctor, 1-2 station hospitals, 4-7 rural health centers (RHCs), as well as varying numbers of rural sub-RHCs. RHCs are run by a health assistant and have a catchment population of 20,000. Sub-RHCs often are run by a midwife or health assistants, staffed by volunteers, and have a catchment population of 5,000. This latter, most basic component of the formal health infrastructure, conducts immunizations and other health programs. While this structure works in theory, on the ground, with various health providers and ongoing ethnic tensions and violence, the reality in many of these townships is far different. In one example of this, Aung et al (2016) looking at rural and urban disparities in health-seeking for fever, found that “rural populations need improved access to trained providers” and increased knowledge of malaria prevention and treatment. That study recommended more trained health workers and health centers were needed in rural areas, and that they should be easily accessible and affordable to the population. However, poor education standards in rural areas in recent decades has resulted in fewer people of rural background having sufficient education for entry into tertiary education. As such, fewer rural people train to become health professionals, also leading to lower numbers of ethnic minority people becoming qualified health professionals in the country. Overall, at a national level, Myanmar has an insufficient number of health professionals that are representative of the diversity in the population, in ethnicity, gender and language capability. Those that exist are unfairly distributed with varying degrees of competence. These shortfalls significantly disadvantage ethnic minorities. Between 2011 and 2015, government expenditure for health increased 8.7 times. The NLD government has continued this trend and set out their own plan: A Roadmap Towards Universal Health Coverage in Myanmar. A broad and ambitious document in scope, it aims to address social determinants of health and looks to reinforce the previous military government’s ambitions toward universal health coverage. There are similarly greater ambitions to reach rural communities and ethnic minorities than previously outlined. The core component of the Myanmar National Health Plan drafted by the NLD government sets out access to a Basic Essential Package of Health Services for all by 2020 as its core goal. Furthermore, it looks to improve financial protections and “alignment” of health services – (also known as “convergence”) – in rural and ethnic minority areas. In general, and disproportionately in urban areas, health services will increasingly have to tackle both communicable and non- communicable diseases. One study found that currently 59 percent of deaths in Myanmar are caused by non-communicable diseases, a figure that will rise as wealth increases. In the immediate term, the core problem is equal access to services, particularly between ethnic groups. That is not to say that service delivery in ethnic minority areas is necessarily worse, on the contrary, in many ethnic areas, service delivery is highly effective, often supported by the long-term commitment of faith-based NGOs. In some cases, such as in Wa State,which is supported by strong Chinese ties, ethnic minority health care is superior to Myanmar government health services. In general, resource allocation needs to more closely align with reducing disparities in health services. The centralization of the health system increases these disparities. However, decentralization of the health sector is limited by the 2008 military drafted Constitution which enshrines central or national level control, not state or subnational control, over health expenditure. Such are the disparities between ethnic groups that a gap of 11 years separates the highest and lowest averages of life expectancy in Myanmar. Even so, the average life expectancy of the general population at birth in 2015 remained low – 65 for men and 68 for women, the lowest in Asean, as demonstrated by the region in the health output scoring index (HOSI) in figure 1. Health services are well below acceptable levels across all regions. Discussions in the first-year both at national and subnational levels revolved around suggestions that health care systems in sub-national areas could “converge” under one central government-directed and administered health system. However, while many challenges towards any convergence of subnational and national health systems remain, many more remain for the improvement of the national health system itself. Internal migration in Vietnam and South Korea has shown that such movement helps to reduce overall poverty and bolster long-term development. However, in the short term, migration can create more vulnerable individuals and families as incomes and assets are more at risk. As a result, and lacking support networks, recent migrants – many of which are from ethnic minority backgrounds – may be more at risk from health problems. In particular, rural-urban migrants are at risk for sexually transmitted diseases, drug and alcohol consumption as well as mental health problems among the largely young, single, and rural men migrating to urban environments. They are also likely to be among the most impacted by high out-of-pocket health cost. One study found that from two (non-ethnic) regions in Myanmar, men were twice as likely to migrate than women. Internal migration will continue to put pressure on the access to health services, and other areas, and must be addressed by the government. Much of the current and most of the past research and data collected by the government in Myanmar has been in majority ethnic Burman areas. As such, policy has focused on the majority ethnic group. Increasingly, since the 2011 democratic transition began, this is improving, albeit slowly. The sensitivities around the collection of data were realized by the government when it commissioned a nationwide census in 2014. Sections of this data that pertain to ethnicity and religion, and was deemed too sensitive, was not immediately or fully released. This demonstrates the difficulties that data collection and thus data-derived policy continues to have in the country. Moreover, political interference in data collection and continued high levels of fear among the general population in expressing negative views of government, hamper accurate data collection. One example is an analysis of the 2014 census data that revealed that maternal and child mortality rates were in fact twice as bad as previously reported. As noted by Khan et al (2016), disparities are exacerbated by the unequal allocation of scarce resources. They note that studies by researchers in certain regions are restricted or discouraged by authorities, including the monitoring of the collection of data at health facilities Indeed, others note that much of collected data and allocated funding only reaches Burman and Buddhist areas and not other ethnic groups, or is unequally collected in these areas. Often international NGOs support ethnic minority groups almost exclusively, at times straining relations with the Burman-majority authorities and local communities. Such has been the case in troubled RakhineSstate, which has witnessed riots against international NGOs or UN agencies seen as supporting the Muslim population and not the ethnic Rakhine population. Myanmar’s health information system is highly centralized, discriminating against poorly represented ethnic minorities. Since the transition, there has been more leniency allowed in letting townships devise and institute their health plans along a framework of goals established by the MoHS. Numerous INGOs support the development and implementation of comprehensive township health plans. The lack of infrastructure in Myanmar, including insufficient electricity and until very recently the lack of internet meant that many remote townships, particularly those in ethnic minority areas, worked to some degree almost independently along government-decreed overarching goals. Lastly, a key remaining problem is that health information is not shared between health providers in ethnic minority areas, in particular, due to a lack of trust, between ethnic health organizations and the government. Responding to these concerns is a $100 million, four-year pilot program in Myanmar and other low resource countries led by Bloomberg and Australia’s Department of Foreign Affairs and Trade to improve the quality of health information collection. A 2014 study based on interviews of representatives from international agencies working in Myanmar explored views of how to strengthen the health care system. Among the problems cited were impediments to service delivery as a result of health system weaknesses and bureaucracy, including human resource problems, data and logistical problems and not surprisingly insufficient or inadequate medical equipment, infrastructure and resources. Looking ahead, Hernandez and Myint (2017) suggest that “older people should be targeted as an approach to tackle the high burden of NCDs and create a strong health system.” They note that 85 percent of aged people live with family, more than half in this circumstance contribute to household income but also provide free childcare to grandchildren, allowing parents greater freedom to work and move. The economic benefits of this are obvious; this should similarly benefit growth in ethnic minority areas, many still ravaged by conflict-related illnesses. Similar attention should be extended to all vulnerable people but ultimately all of Myanmar’s people are best served by an overall improvement of the health system and universal access to healthcare. A special focus on the three building blocks highlighted in this post would help give a much needed shot in the arm to healthcare in Myanmar. Myanmar has a long way to go to improve its health system and ensure accessibility for all, needing improvements for ethnic minority access in particular. If it is to reach SDG 3 goal “to ensure healthy lives and promote well-being for all at all ages” this will take continued effort by all in government and require the support of the international community, donors and all ethnic groups in Myanmar. Elliot Brennan is an independent researcher. He previously worked with the Joint Ceasefire Monitoring Committee and the Myanmar Peace Centre in Yangon. He has held positions as a research fellow with think tanks in Europe and the USA as well as working with the Lowy Institute’s Interpreter and IHS Jane’s.